Sitting down to eat a juicy and flavorful steak is a pleasure that’s hard to beat. When cooking steaks, you have tons of options, and they all give you different results. If you’re a person that simply plops your steak on the grill, then you’re missing out on the complex taste and texture that smoking can give your meat. When you smoke meat, it gives it a unique flavor that most people find irresistible. It’s a little more time-consuming than grilling, but the process is quite easy. You can use a smoker, or if you don’t have a smoker, you can transform your grill into a makeshift smoking machine. What Supplies Do You Need to Smoke Steak? One of the most important parts of cooking a steak is getting a juicy and tasty piece. And there’s only so much that seasoning and cooking can do for a cut of meat. Seasoning a steak is important, but you only use seasonings to accent the complex taste of the meat. For smoking, you need to use a boneless cut; something like a boneless rib-eye is perfect. Getting meat from the grocery store is fine, but if you want to experience a really great cut, you are going to have to visit a butcher. Try to find a piece that is about one inch thick. Make sure that it is as fresh as possible; look for a steak that has a bright red color. Always check a piece of steak’s marbling before you buy it. Lots of people fear fat, so they look for steaks that have no fat running through them. This is a mistake. The marbling that runs through a steak gives it most of its flavor, and it makes the steak tender and juicy. Look for small streaks of fat that run through your piece of meat. It’s important for your steak to not be cold before you smoke it. Smokers don’t reach a high temperature, and if your meat is cold or frozen, it won’t cook correctly. Make sure to only leave your meat out for an hour or so. You don’t want to leave it out long enough for bacteria to grow on it. If you are marinading, make sure to leave your steak it in the fridge during the process. A good marinade is highly acidic, and that tenderizes the meat. Some people wait until their steaks are sitting outside to put them in the marinade. You don’t need to do this. It works fine in the fridge, and you can leave it in the marinade for longer. Good cuts of meat don’t necessarily need marinade, but if you’re looking for a unique flavor, then give it a try. If you aren’t marinating, sprinkle your steak with generous amounts of salt and pepper. Using a smoker isn’t that hard; you just need to remember that your steak is isn’t being cooked by a flame. Put charcoal into your smoker and light it; wait until it is covered with gray ash. Once your charcoal is nice and hot, separate it into two piles. Place your pan of water between the two piles of charcoal, and take your steaks and place them on the grate over your smoke source. Keep your charcoal nice and hot by adding to it every hour or so. If you want more flavoring, then add in your soaked flavored wood chips. Apple, cherry, maple and pecan all give it a unique and delicious flavoring. You can do the same thing with your grill. Set up your smoking equipment below the grate, and put the steaks over the pan of water. Always keep your lid closed, but make sure to open the vents on the side. When you smoke steaks, you need to check the temperature of both your steaks and the smoker. You want the temperature to be a constant 225 to 300 degrees Fahrenheit. Use an oven safe food thermometer to monitor your temps. The best type is the one where you can leave the probe in the smoker and monitor from inside the house or around the yard! 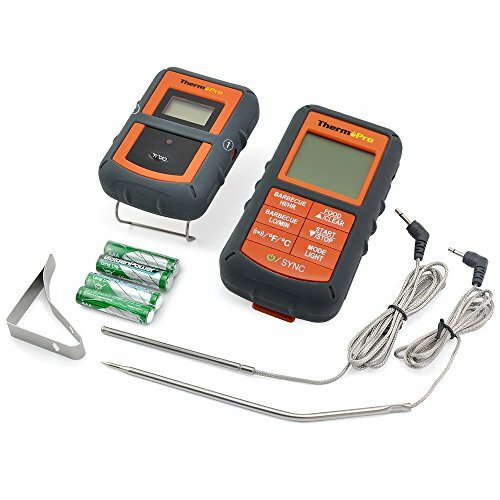 If your grill or smoker already has a thermometer built-in, you can just use that to estimate your heat levels. Smoke your steaks until they reach 145 degrees Fahrenheit. This usually takes about an hour or two. Don’t forget that smoked meat looks different when it comes out of the smoker. It might have a different color tint to it. If you want some grill marks and coloring, use your grill to sear your steak for a minute or two on each side. Smoking your steak brings out its deep and rich flavor, and it tenderizes your meat unlike any other cooking method. If you’re looking to try something new, give smoking a try. The cooking process is longer than grilling, but you don’t have to keep your eye on your meat for the whole time that it’s cooking. It’s actually quite easy to smoke your meat to delicious perfection. Many years ago, smoking was a technique used for preserving meat. Since the invention of refrigerators and freezers, preserving meat has become a lot easier and smoking meat has not been a necessity. However, barbecue enthusiasts today will smoke meats to acquire a different flavor altogether. This method of cooking brings out the vivid tastes in an assortment of cuts of meats like fish, briskets, and ribs. If cooked properly, the outcome of your meal will be a moist and an appetizing entrée. That said, if done incorrectly, your meal can turn into dried out, leather jerky. Luckily, there are a few tips you can follow in order to prepare a delicious barbecued meal. It is important to find a smoker that will suit your needs, especially if you are planning on smoking your food frequently. Now, if you decide that you want to use this culinary method only occasionally, then you can use a charcoal smoker or even craft your own smoking pit. Regardless, whenever you decide that you are ready to purchase a smoker, make sure to deliberate the following possibilities. These kinds of smokers are relatively expensive, and they are easy to use and do not require constant attention. Nonetheless, if you should decide to purchase an electric smoker, then be ready for a change in flavor as this method can alter the taste of your barbecue. These smokers are a great medium when comparing electric and wood smokers. With a gas smoker, your food will have more flavor than what you will receive with an electric smoker, but there will not be as much flavor that you can receive with a charcoal or wood smoker. These types of smokers use a mixture of charcoal and wood as a fuel source. Since charcoal burns without difficulty and gradually, you will not have issues with controlling the heat. Wood can prove to be more complicated to burn; however, it does provide the meat with a great taste. While cooking with wood can be more difficult than other techniques, it does provide briskets and ribs with the greatest smoky flavor. Hardwood blocks and chips are utilized as the fuel source and require frequent attention to maintain an even temperature. The kind of wood chips you use for smoking meat will become a huge role in the elaboration of flavor of your food. This kind of wood gives your barbecue a lightly sweetened taste and works best with poultry or fish. This provides a mild and sweet taste to your food. Pork, poultry, or fish are recommended meats to use with these wood chips. This kind of wood offers a sweet yet mild taste to food that is smoked with it. It works very well with unseasoned meats such as pork, turkey, or beef. A robust and smoky taste is what you can expect when using this kind of wood. It is best suited for beef and lamb. A sweetly smoked flavor is what this kind of wood offers your food. Maple chips work best with pork or poultry. This kind of wood is very robust and smoky. It is highly recommended to use for short grilling over long smoking and works best with ribs, pork, or beef. This type of wood burns slowly and offers a robust flavor as well as being adaptable. It is recommended for meats such as pork, beef, lamb, or wild game. This method is worth taking into consideration. Some people believe soaking wood chips will make your barbecue turn out better, while others declare that this can essentially worsen your meat. Smoking meat is designed to be a lengthy procedure, therefore it is vital to verify that your wood chips do not burn too fast. Some people have stated that soaking smaller pieces of wood will allow it to burn at a slow and steady speed. The same folks also agree that bigger pieces of wood should stay dry. On the flip side, others say that you should not soak your wood chips at all because it does not keep the wood burning at a steady pace, nor avert flare ups as well as can forfeit the flavor of your meats. However, the best approach to this technique is to try both before choosing which one you prefer. You can also try soaking half of your wood chips while leaving the other half dry. This mixture of soaked and dry chips could be the ideal flavor combination you are searching for. Yet another method to test out is soaking your wood chips in your preferred beer or wine and observe the results it has on your meats. While it is possible to smoke any kind of meat, it is a particularly effective cooking method for stronger cuts of meat. Since the cooking progression is rather slow it lets the consistency become incredibly tender. If you have a side of beef there are select pieces that will definitely be better for smoking. For example, sections at the front quarter of the cow are worked much harder, so the connective tissue is much more dense and intertwined. This just means, you’ll need the long, slow process of smoking to realize some tenderness. But ideally, cuts from the hind-quarter region of the animal is going to give you the most tenderness. Certain meats that are really improved by the smoking method include beef and pork ribs, briskets, chicken, corned beef, ham, lobster, pork roast, salmon, trout, and turkey. One of the biggest errors we all make while cooking meat is constantly removing the lid to inspect the meat’s progress. Unfortunately, this mistake can change the result of the meat and create undesired outcomes. When the meat you have smoked is done, it is a good idea to add a single glaze of seasoning and smoke for an additional ten to fifteen minutes. When you do this, you will provide more moisture and flavor to your meal. And just as importantly, you’ll ensure a super tender steak on your plate that’ll simply be unforgettable.